Stacie grew up in Ahwahnee. She attended Fresno Pacific University, graduating with a BA in Management and Organizational Development in 1998. Stacie married Dr. Lazarcheff in 1999. They have 2 children, Gabby and Wyle, a German Shepherd named Stark, an Australian Shepherd named Meg and 2 cats, Rod and Kit. In her free time, Stacie enjoys playing tennis, camping and spending time with her family. The Hawksworth Tree, a giant Sequoia in Nelder Grove, is named after Stacie’s Grandparents. Christi is our Lead Receptionist. She is a very proud Mom of 3 beautiful children, Ethan, Katie and Eli, and enjoys hiking in the Sierra National Forest, camping and lounging on the beach in Santa Cruz. Christi has a lap dog named Zena, two cats, Kora and Archimedes, and a Beta Fish named Flo. Christi’s personal trainer in high school was Dave Draper, the Blonde Bomber. He taught Christi that form is key. 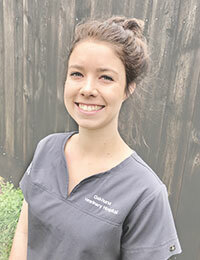 Kelsey joined the Oakhurst Veterinary Hospital family in June 2011. 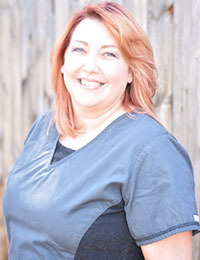 She attended college for pharmacology and has continued her education in Veterinary Medical courses throughout her years in practice. She enjoys spending time with her daughter, 3 dogs and 2 cats. Kelsey has been working in the Veterinary field since she was 17 years old. Morgan joined our team in January of 2017. Morgan is a kind and loving person who loves animals. Born and raised on a small farm in Mariposa, she was surrounded by dogs, cats, horses and small livestock. Morgan has attended Feather River College and participated in their horse training program and continued her education at Merced College. In her spare time, Morgan enjoys riding her horse, camping ad spending time with family and friends. Morgan knows every line from TV show, The Office, by heart. It’s her favorite show. Shannon moved to the Oakhurst area in 1977 and attended Yosemite High School graduating in 1990. 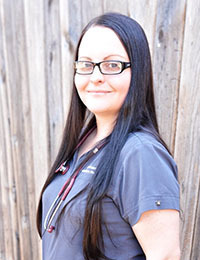 After high school, she attended Jan Joaquin Valley College for Veterinary Technology. 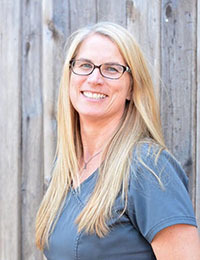 Oakhurst Veterinary Hospital began Shannon’s career and dream of being a technician in 1991. She enjoys her busy life, especially her son Daniel. She has 4 dogs, 3 cats and a Pot Belly Pig named Isabelle. 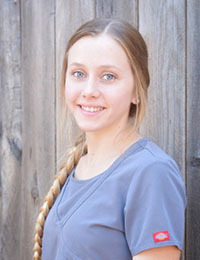 Shannon’s favorite thing about working at Oakhurst Veterinary Hospital is seeing the animals and making new friends. 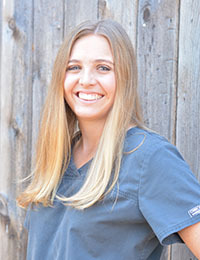 Taylor graduated from Oakhurst Community College and continued her education through an online Veterinary Assistant Course at The Animal Behavior College. Taylor comes from a family of 10 and has two cats, Mya and Biscuits, and a dog named Spalding. Taylor is vegan and does not eat anything that comes from an animal. She does her best to use Vegan/Cruelty-Free products in all aspects of her life. Rachel was born in Ahwahnee, California. She lives on a working cattle ranch and tends to the many responsibilities there. She obtained her Associate of Science in Veterinary Technology in 2012 and plans to obtain her Registered Veterinarian Technician license. When not working as a technician she enjoys camping, riding horses, and spending time with her family. 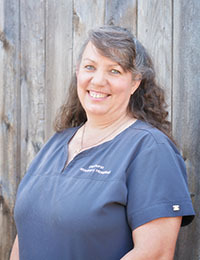 Rachel has been working at Oakhurst Veterinary Hospital since 2012.